It doesn’t seem like just a couple of years ago that I had heard about The Newsroom, the people attached, and of course, that it was Sorkin. I’ll be totally honest: I’m not one of those Sorkin-lovers that has followed every single thing he’s done, and I didn’t watch every single second of West Wing. The greatest push for Sorkin’s newest series was on social media, and I was immediately behind it. I was aware of not only the push by HBO and traditional Sorkin fans, but also fictional characters from former Sorkin projects — specifically, The West Wing. People followed, retweeted, and shared updates from fictional heads of state and Presidents as if they had actually voted for these people. And these characters responded, in their character voices, and it was amazing. Long after these series had ended, the characters lived on. So — confession time, I suppose. For the past 3 seasons I have been the voice behind one of Newsroom’s most beloved characters on Twitter, the incomparable Charlie Skinner. And, to be perfectly clear, yes, I was the first. For the first time in as long as I remember, I sat down on my couch and watched a television show live that wasn’t The Walking Dead. Now, for my work here at justusgeeks.com, I primarily only deal with geek and pop culture subjects. I don’t get political and we don’t really focus on social issues. I’ve done a pretty good job of weeding out a lot my own personal passions from JustUs Geeks, and very few people know that I am actually incredibly passionate about political and social issues; almost too passionate at times. As I sat on the couch, and watched the very first episode, I created @SkinnerACN. He was perfect; a wonderful blend of humor and blatant crass. It was like Sorkin had created a character just for me. And the bow tie; who doesn’t love the bow tie? As the season went on, and the show entered Season 2, so did Skinner. I was incredibly surprised at the following around the characters from Newsroom on social media. People took to Twitter whenever news broke, as they wanted Will McAvoy’s take on news as it happened. Now it’s over. Cut short in its prime, The Newsroom takes its final bow, and it just doesn’t seem enough. Not enough time, not enough stories, and certainly not enough of the brilliantly crafted characters. The actors behind every single principal character in this series are well-deserving of the nominations they received and the awards they didn’t. This is a lot harder than I anticipated; this isn’t well written, and doesn’t seem very fitting for Charlie. Charlie was an excellent avenue to be that voice for political commentary, thoughts on social injustice, and my overall displeasure in local and national situations. 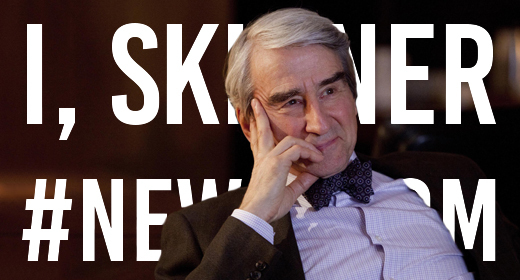 Ultimately, that’s the beauty of Charlie Skinner, in my opinion. He pushed the envelope, he expected the best, and was open about his shortcomings. How do you say goodbye to a character you’ve found so much of yourself in? I haven’t really decided how my Charlie Skinner will live on after the final episode, but I can tell you for sure that these characters will live on. Breaking news will still be discussed by the news team on Twitter, and the characters will live. So, if you’ve followed along, thank you. You can find all of The Newsroom now online on HBO Go.